5810 - Hinge-Covered Box, Non-Freeze Boxed Ground Hydrants - Jay R. Smith MFG Co.
A hydrant with a hinged covered box, for positive protection against freezing when buried outside or in unheated areas and the closing valve is located below the frost line. When hydrant is shut off, water is drained from the casing through the drain hole in the valve housing. The locking cover prevents unauthorized use. Bronze Non-Freeze Ground Hydrant with "T" Handle Key, and Bronze Hydrant Box. Inlet Size Furnished as Indicated by Figure Number Selected. Smith No. 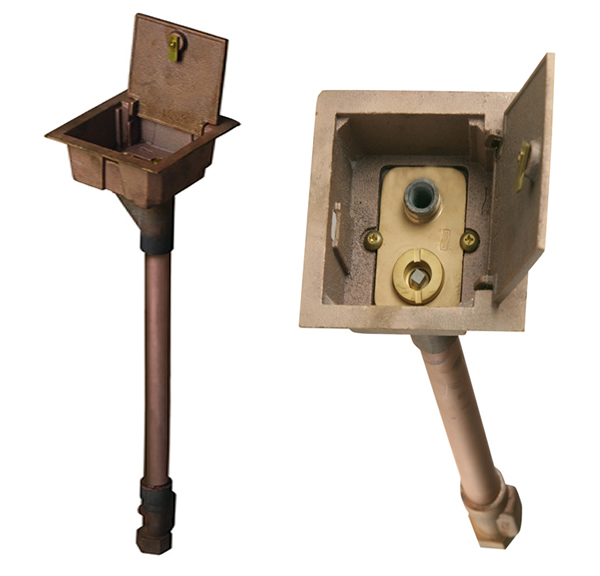 5810 rough bronze box with bronze hydrant, “T” handle key and bronze casing with 3/4” female NPT inlet. Smith No. 5811 for 1” NPT inlet. Smith No. 5812 for 1 1/2” NPT inlet. Smith No. 5813 for 1 1/2” NPT inlet. Smith No. 5814 for 2” NPT inlet.